These serious looking chaps were the Allied Commanders for operation Overlord and are shown here at Southwick House just over a mile north of Fort Southwick. 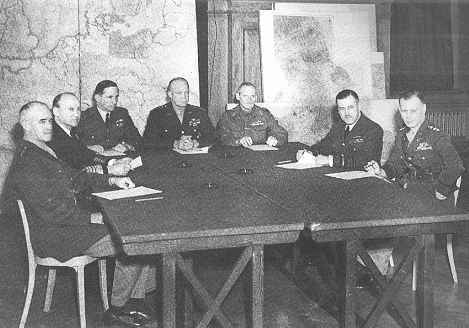 They are left to right: Lieutenant General Omar Bradley; Admiral Sir Bertram Ramsey; Air Chief Marshal Sir Arthur Tedder; General Dwight D. Eisenhower; General Sir Bernard Montgomery; Air Marshal Sir Trafford Leigh-Mallory; Lieutenant General W. Bedell-Smith. This map shows the troop and material marshalling area around Portsmouth on the run-up to D-day. Fort Southwick is arrowed. Notice how the Fort - and Southwick House - have been given a wide berth by these areas in case they attracted the attention of the German Luftwaffe. 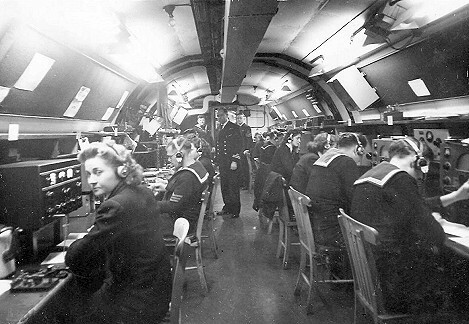 Naval wireless transmission (WT) room. The WREN on the left is operating an RCA AR88 communications receiver. These were obtained under the lend-lease agreement with the USA. They operated on a frequency range of 535KHz - 32MHz and weighed 100 pounds. known as B34s in the RN. 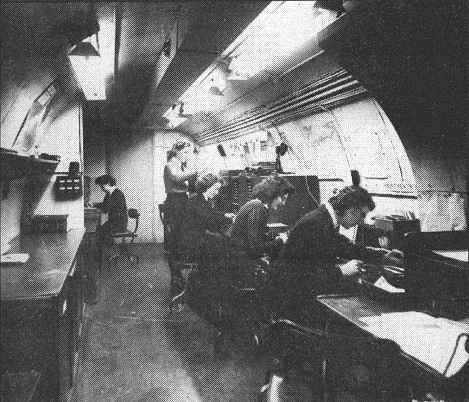 Wrens deep underground in the Naval cipher room. 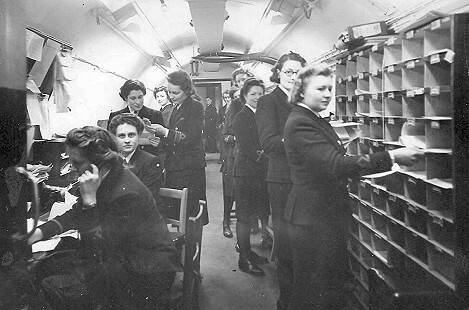 The Naval Signals Distribution Office in an unusually wide section of the tunnels. GPO carrier equipment room. [location 86 on plan]. The chap in the foreground of the photo has been identified as probably Norman Hishon or less likely as Alan White. The chap in the background is possibly Ollie Philmore who was in charge at the time. Most importantly this photo has now been identified by two different sources as having been taken in the late 1950s / early 1960s which puts it in the Cold War period and not WWII as previously thought. 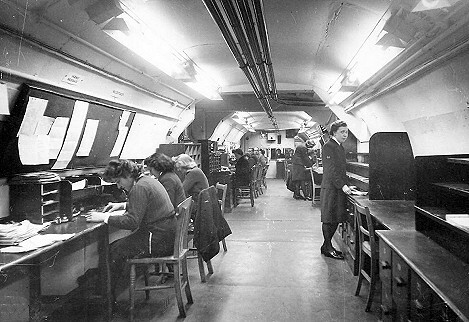 I worked in the underground communications centre ( QQCD ) at Fort Southwick and was on duty on "D" day, June 6th 1944.I was also on duty during the Royal visit which took place Sept. 1944 and the published photo was taken at that time - not in the 1950s or early 1960s. 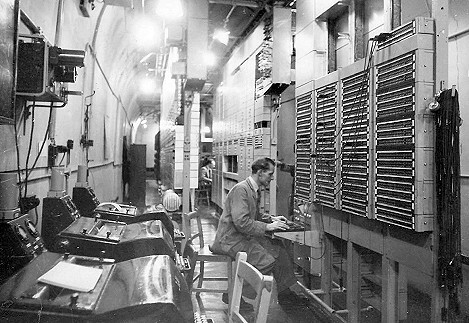 Pat Philmore, in those days was only responsible for the repair and maintenance of the teleprinters. He had a small workshop off one of the GPO main equipment channels. 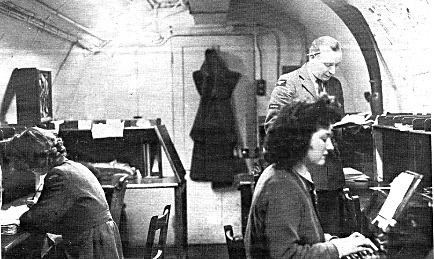 Regarding the GPO carrier equipment room, location 86 on plan, the fellow in the foreground is Vic Pont and the fellow in the background I think is Sid Scott and not Pat Philmore. 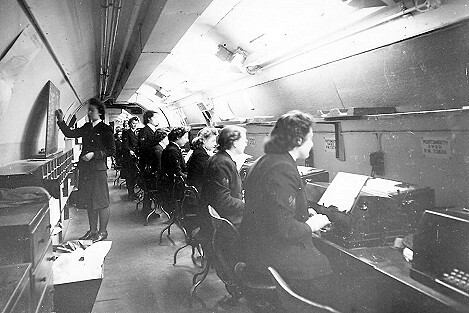 The tunnel with the people in the picture was the voice frequency telegraph carrier ( VFCT ) room interconnecting all the teleprinter circuits to many other communication centres.